looks like i'll be living out of boxes for a while. unless someone wants to donate a wall sized shelving unit, and organize it for me? no? fine, i'll just whine about it... sigh. 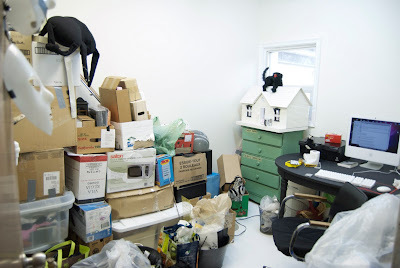 Welcome to how I work everyday for real........a studio filled with boxes to dig through. I did want to be an archeologist at one time. It is a pain to dig sometimes, especially when you are in a hurry......what about simple block and board shelves? Wish I lived closer, so I could help. Magda I sooooooo wish you didn't live so far! I totally have one of those big restaurant metal racks on wheels that you could have and I would totally take a day and organize it for you!!!! I love your blog and the minimilistic style to your amazing art! At some point I AM going to get to own an original!!!!!!! The piece about the female artists had me cracking up but as i read down ,yes it is sad too! Hopefully we will be some of the women to change all that!!!!! !